Since last Thursday, we have been in a mode of try to stay dry, try to get well, and try to really clean out the spare bedroom/crafting room. Last Thursday I had to pick Em up early because she was running around 102 temp. Luckily I got her into the dr, and sure enough, strep throat. Apparently it is going around right now, which is completely the wrong time for it. She is doing much better, thank goodness. Since she did not feel too well, I put the air mattresses in the living room floor and we slept there. Friday was not too bad. Then Saturday morning I was awakened to the sound of thunder about 4:30 am, which lately has not been an unusual occurrence. I went back to sleep and then was rudely awakened to a complete downpour about 7:30. 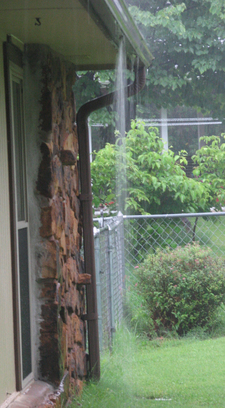 We went to look outside and even my gutters could not handle the amount of rain we were having. There was flooding in town, and we even made the national news. I know at my house, I had 3.5 inches of rain in the space of a few hours. We are so water logged, the earth takes forever to soak it in. I keep wondering if we moved the Pacific Northwest.. waiting for lots of pines and ferns to spring up and all of our grass to rot. They had to close quite a few bridges in and around town. I even saw children swimming and canoeing in a baseball field that was about 3-4 feet under. It was just amazing. We are still having rain. I just checked weather.com and there is this huge mass of rain over us right now. So far our total for the month of June as of yesterday is 9.08 inches, and the total for the past 90 days is over the 20 inches mark! I just wish this silly front that is causing this would move. I mean really, it could go vacation around Lake Tahoe, they actually need the rain. 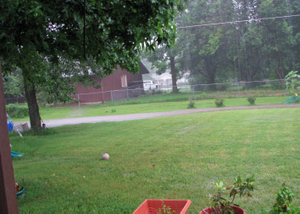 Em has Vacation Bible School this week, and I know a lot of their activities have been changed due to all this rain. But Emma is sure having a lot of fun, which I am glad. Something different to do over the summer. I better get ready for work, but I will leave you with some pics from my cell phone I took when we took a drive Saturday evening, after the rain stopped for a little while. Fireworks stand and floating porta pottys. Bet they won't put the stand there next year! This is Swan's Dairy. 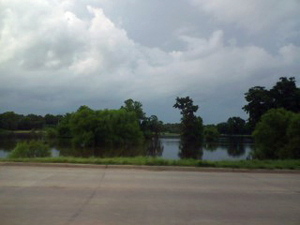 What you are seeing above is there dairy cattle field, which is now a big pond. It has since "soaked" in, but I am sure since I have lived in Claremore, I have never seen it made into a pond that lasted for 24 hours. And above is what I did while it rained. I have posted them in my Etsy Shop. 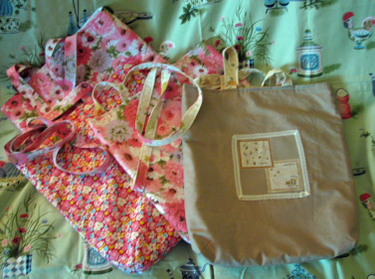 I made tote bags, that is until my Singer CG-590 quit on me. Murphy's Law - I have had it just over a year and my needle will not move, and I cannot turn it with the handwheel. Oh yeah... I still have yet to take it into the shop. I am just not happy about this, and having panic attack withdrawal issues now. If it will stop raining long enough today, I will take it in to get it fixed. Anyone had this happen to them before with their machine? Okay, I will post a "real" post later in the day, but currently I am busy busy busy.. finally posting all of these patterns we found in my mother's Time Capsule attic as well as other things. I am putting some items in Etsy and the others (mainly crochet magazines) in Ebay.